BIG BLUE WAVE: How did a Non-Catholic Become a Doctor of the Church? How did a Non-Catholic Become a Doctor of the Church? When Pope Francis says to look to the periphery, boy he ain't kidding! It turns out St. Gregory did not belong to a Church in Communion with Rome. 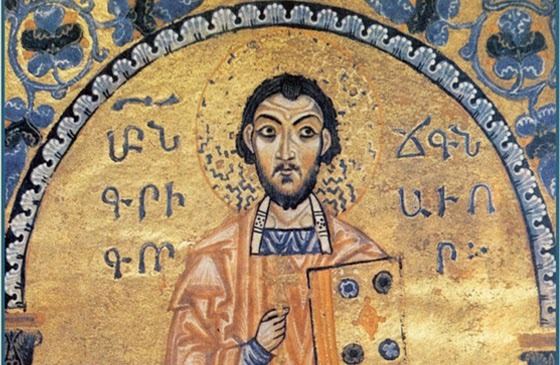 He was a member of the Armenian Apostolic Church, who did not accept the Council of Chalcedon. In everyday theological language, we call this Church "monophysite." However, their correct doctrinal description would be miaphysitism, which does not consider Christ to only have a divine nature, but a combined divine-human nature. In 1996, Pope St. John Paul the Great and Catholicos Karekin I -- the head of the Armenian Church-- signed a declaration saying that such the semantic distinction on the nature of Christ was no basis for the separation of the two Churches. In other words, the two churches share a Christology. Okay, but this Armenian Church isn't in Communion with the Catholic Church and St. Gregory was not in Communion with Rome during his lifetime. How can we accept this saint as a Doctor? There is a precedent. When part of the Armenian Church came into Communion with Rome in the eighteenth century, the Catholic Church accepted all the Armenian saints, so long as they did not explicitly contradict Church teaching. It appears that St. Gregory of Narek is accepted on this premise. Now I can't speak to why he should be considered a Doctor. I'd never heard of him before and I've read nothing of his, and I'm not even sure what his contribution should be. In the Western Church, we're more used to Doctors who write treatises and essays, not poetry. You can find his writings here.